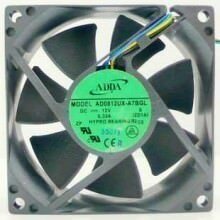 "I bought several of these fans to reduce the noise db level of my chenbro 41616 chassis. These fans draw 1/3 the current yet the rpm is greater than the 2000 rpm threshold of the fan alarm. Noise was greatly reduced compared to the original fans yet I have plenty of airflow to cool my LSI-9305 16i hard drive controller and keep everything cool. Love these!!!" Click the button below to add the ADDA 8025 80mm 12V 0.33A Hypro Bearing PWM Fan to your wish list.